Aloysius Pang is "liberated now", says his parents. The actor's remains have been laid to rest at sea after being cremated, according to posts on manager Dasmond Koh and his artiste management agency's Instagram platforms about an hour ago. Written in Chinese on his personal account and then in English on NoonTalk Media's Instagram account, the post read: "We sailed across the calm waters on this cloudy afternoon. At a spot near Pulau Ubin, we saw you descend slowly into the sea. This is the final farewell." @Aloypang’s parents would like me to convey this: He is liberated now. We sailed across the calm waters on this cloudy afternoon. At a spot near Pulau Ubin, we saw you descend slowly into the sea. This is the final farewell. You wouldn’t want to trouble anyone. It’s so you- the easy going boy, as always. Thank you for trusting me, and for working so hard in the last few years. As you begin your free-spirited adventure, remember to wait for me. A sea burial was apparently what the "easy-going" Aloysius would have wanted. Wrote Dasmond: "You wouldn’t want to trouble anyone. It’s so you." He ended the post by saying: "As you begin your free-spirited adventure, remember to wait for me." 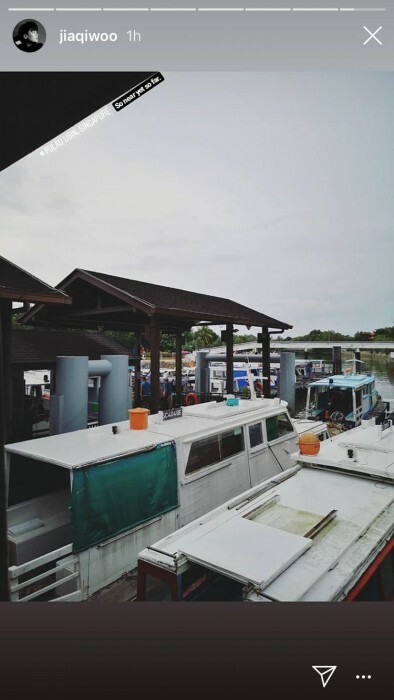 Aloysius' girlfriend, actress Jayley Woo may also have been present at the ceremony, as she posted a photo of the jetty at Pulau Ubin on her Instagram Stories, with the caption: "So near yet so far." Earlier this morning, Aloysius' ashes were collected from Mandai Crematorium by his eldest brother. Grim-faced and wearing a pink T-shirt and flip-flops, Jefferson Pang was seen entering the complex at about 9.30am this morning, Lianhe Zaobao reported. It's not clear if he was accompanied by other family members. He exited the building half an hour later bearing an urn wrapped in red cloth. Hundreds of friends and fans of the actor had turned up at MacPherson Lane on Sunday (Jan 27) for the 28-year-old's final send-off. A three-day wake, which began on Friday, and a public memorial service yesterday were held at 82A MacPherson Lane. More than 10 eulogies were delivered by his colleagues, friends and relatives. Aloysius was accorded a military funeral at Mandai, where about 300 Singapore Armed Forces servicemen saluted their fallen comrade. After the cremation, his mother had to be held up by family members as she was sobbing so hard she could barely stand, The Straits Times reported. The actor suffered serious injuries during an overseas military exercise in New Zealand on Jan 19, when a gun barrel of the Singapore Self-Propelled Howitzer he was repairing was lowered. He underwent three surgeries over the next few days and died on Jan 23 after his condition deteriorated. Aloysius' death is the fifth reported since September 2017, and Mindef has said it will set up an independent Committee of Inquiry to look into the circumstances leading to his death.